Hey all and happy Wednesday! Hope you all are having a great week so far! This week has been filled with so many events, and since the weather has been really nice here, Chicago has been so lively and vibrant! I will be headed to the Refinery 29 installation of their 29 rooms tonight, and I am so excited to see all the colors, rooms, and just enjoy it before it opens to the public! I had been looking for a striped dress recently, but some of them tend to look the same, and I feel like they never really have much fit to them. They just kind of seem to hang on your body or have no real shape! I had been eyeing this dress, but sometimes the price tag really kills me. I waited for it to go on sale and finally it did! I really loved that it had an actual shape to it, and that it wasn’t just your typical striped dress. It does run a little large, so I would definitely size down if you are considering it! I wanted to wear navy blue heels originally, but then I remembered I had these shoes! 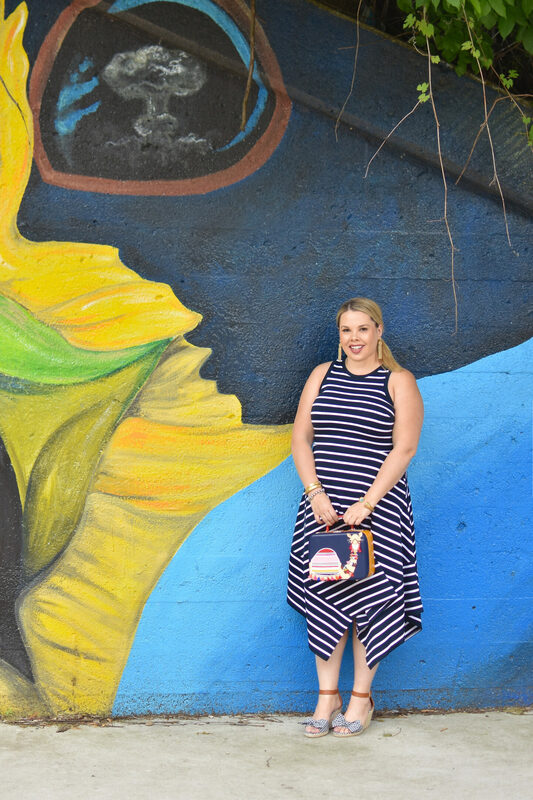 I wanted to give the dress a little something more, so I figured this fun pop of print would be perfect against the stripes! These wedges are super comfy and they really match so much more than I thought they would! Have a fabulous week and enjoy your Wednesday! 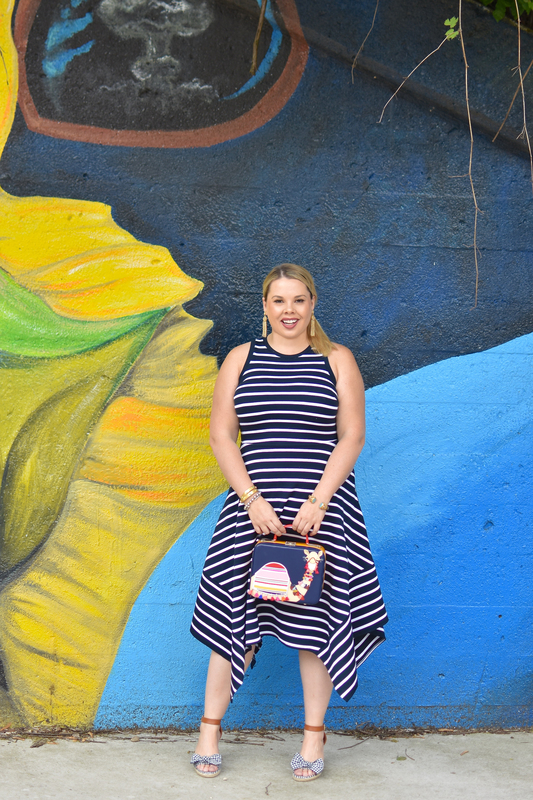 navy striped dresses are so classic and such a closet staple! you look fab! 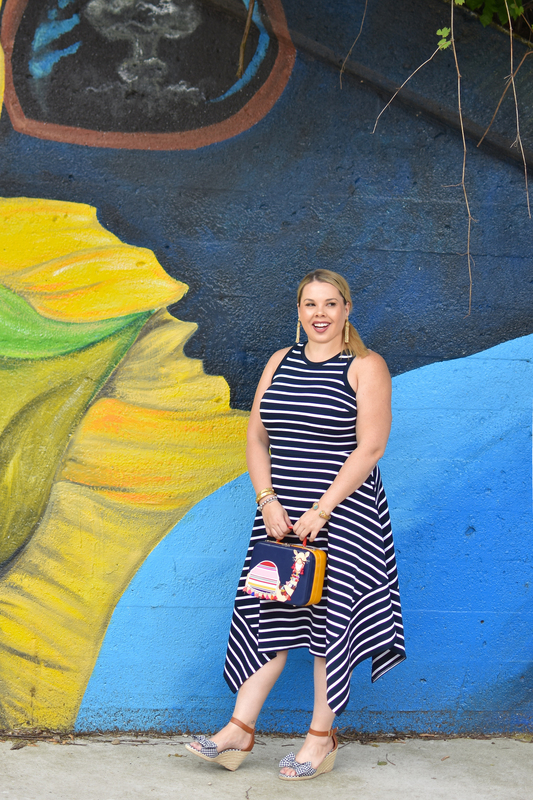 I love that striped dress! Super flattering and a classic staple for sure. Another perfect dress on you! 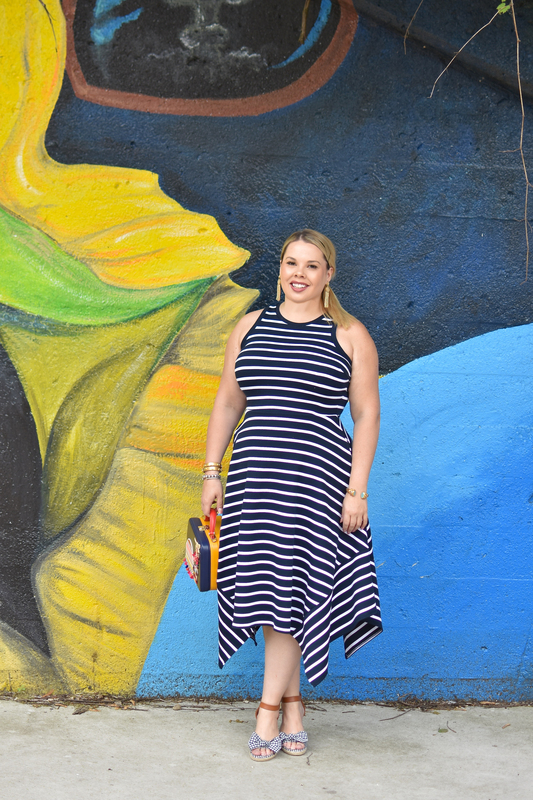 Loving the asymmetrical hem and the stripes; 2 great trends for summer! Oh wow I am loving the hem of this dress! It really adds something extra to such a classic color palette and pattern! 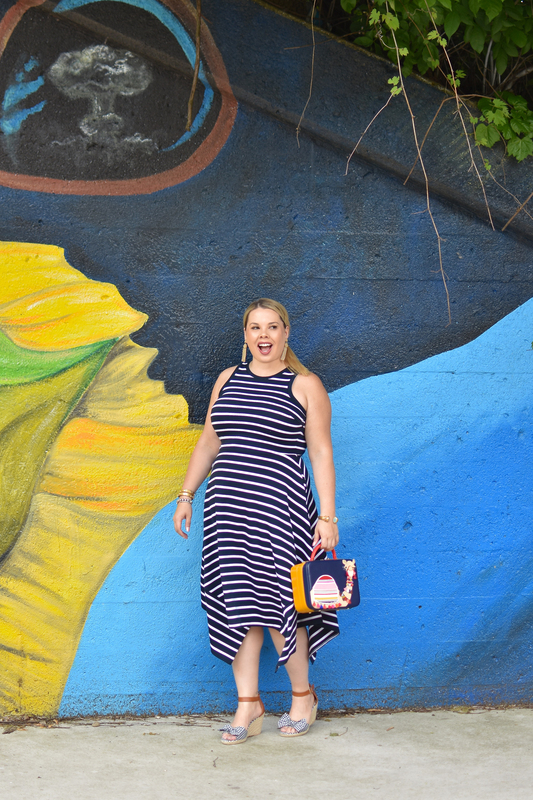 love this simple, yet chic striped dress on you! can never go wrong with a pattern like this one. it’s perfect for summer, and looks really comfortable too! That’s a beautiful dress, I love the stripes! The bag is super cute too. This dress is too cute! I love the cut! Those shoes are the best – how cute are the bows?! 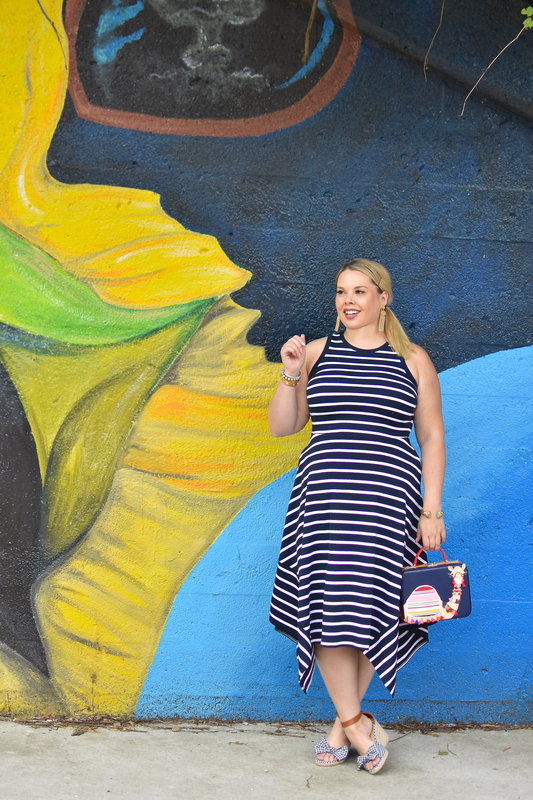 This is the perfect summer dress! Love it with this cute bag too.